Russia has initiated the holding of a UN Security Council meeting on the situation in Ukraine on February 12 under the pretext of the fourth anniversary of the signing of the Minsk agreements, but its real purpose is to divert attention from a special meeting on February 20 dedicated to the fifth anniversary of Russian aggression against Ukraine. Spokesman of the Permanent Mission of Ukraine to the United Nations Oleh Nikolenko said this in a comment to an Ukrinform correspondent. "We are aware that the Russian Federation has addressed the chief of the UN Security Council with the request to call a meeting of the Security Council on the situation in Ukraine on February 12. The declared reason is the fourth anniversary of the signing of the Minsk agreements," the diplomat said. Nikolenko added that the Russian initiative is another "smokescreen" aimed at diverting the attention of UN member states from the first comprehensive discussion of Russian aggression against Ukraine at a special session of the UN General Assembly on February 20, devoted to the fifth anniversary of the beginning of the conflict. "If the Russian side is so deeply concerned about the Minsk agreements, then why hasn't it yet fulfilled any of these documents? Why didn't the Russian delegation to the UN convene a meeting of the Security Council when the proxy forces it supports violated the ceasefire hundreds of times, shelled the residential quarters of Mariupol, Pisky or Avdiyivka, or its gang formations blocked the work of OSCE observers, including by destroying the UAVs of the monitoring mission?" he said. 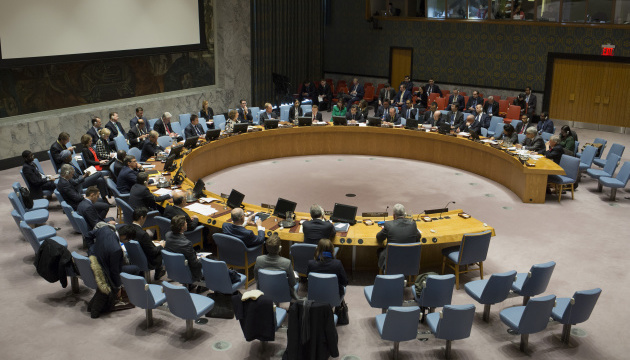 According to the Ukrainian diplomat, no one at the UN believes in Russia's constructive role in resolving the armed conflict against Ukraine, therefore, convening this meeting of the Security Council looks particularly cynical. Nikolenko added that Ukraine would use this event to draw attention to the real situation in Donbas. "At the same time, during the meeting, Ukraine and its partners will inform the international community about the real situation in eastern Ukraine. As we can see, Kremlin-backed forces have in recent days repeatedly fired at the positions of Ukrainian military in Donbas, including with the use of weapons proscribed by the Minsk agreements," the diplomat said. Nikolenko also said that the UN Security Council meeting on Ukraine would begin at 22:00 Kyiv time.